Ah I am absolutely LOVING making this blanket :-) This yarn is a total and utter joy to work with. I think I shall be very sad when it's finished hahaha! To remind you.... this is Invicta Colour and Invicta Extra from Scheepjeswol. I'm using colours 960 and 968 in the colour and a gorgeous vivid green which is 1466 in the extra. I've found a pattern that showcases the yarn perfectly! It's a nice balance of interesting yet pretty simple to make. Pretty isn't it? And best of it's a free pattern! Of course, as usual I will be doing a step by step tutorial once the big reveal has happened. The green around the edges just makes it POP!!!! I love how one ball of yarn gives you so many different variations. It's great fun seeing all the squares turn out differently. Just a little word on blocking.... now I know I drone on and on about the importance of blocking your work ;-) But just check out the pic and see the difference for yourself! I know it's boring, but it really does bring the yarn to life. The drape on the blocked squares is lovely! I try to be organised and block as I go. 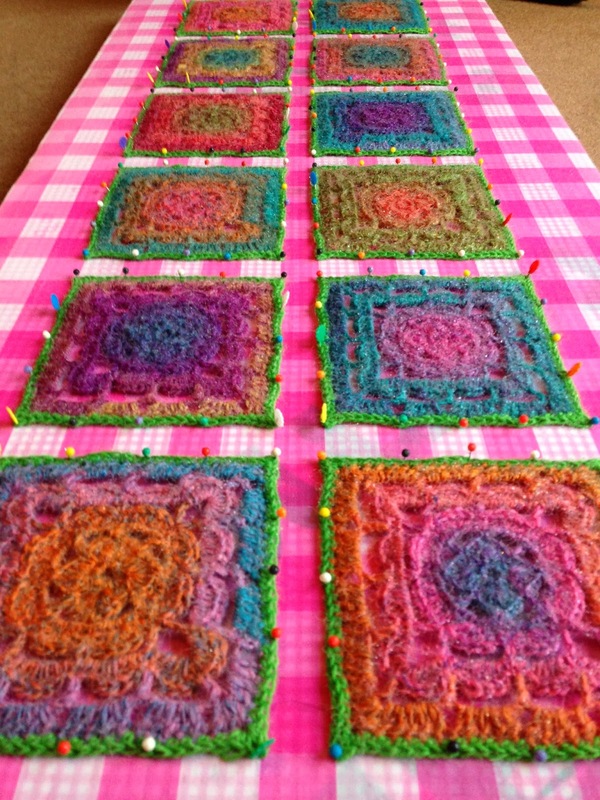 That way, when I've finished all the squares I'm not sat twiddling my thumbs waiting for the squares to dry!!!! So far, I've made 68 squares! I'm just keeping going until I run out of yarn. Then let the joining commence!!! This is so happy and zingy! Beautiful Maria! That pattern shows the yarn off fabulously!